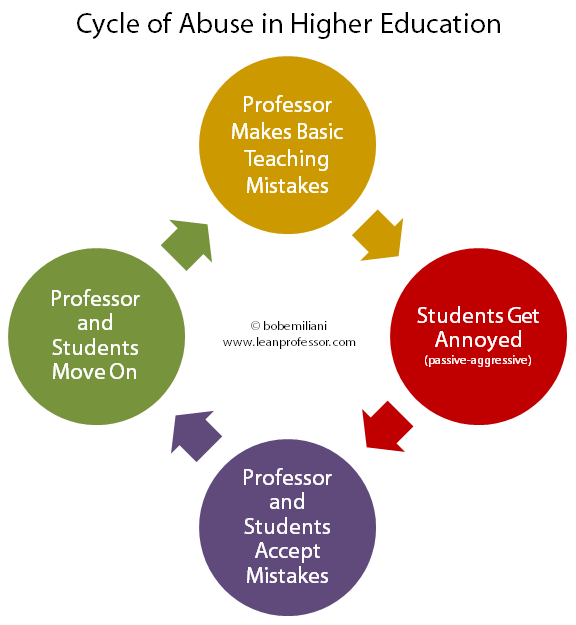 One of the things I was determined to do when I became a professor was to not make the kinds of basic teaching mistakes that I experienced from my professors when I was a student. If I didn’t like something as a student, chances were good that most other students did not like it either. Sure, some tolerated it better than others, and some students got good grades despite the mistakes. It did not make sense to me to repeat the same errors that my teachers made. 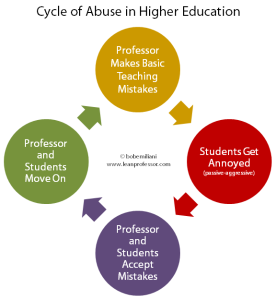 I explicitly wanted to break the (non-violent) cycle of abuse. The feedback that I have received from students over the years on Lean teaching validates my approach. Students learn the material without having to endure any abuse. My recent surveys on the “10 Percent Problem,” “45 Teaching Errors,” and “What is Good Quality Teaching?” inform us all on the nature of the “battered student syndrome.” It is clear: We know what most students like, what most students dislike, and the specific nature of the value that they attach to teaching and learning. Therefore, professors must learn to teach in the ways that students like in order to help achieve learning outcomes and which satisfy (or exceed) the value proposition. Lean teaching does that. While we may not like to think of it this way, annoying one’s customers is an incredibly stupid thing to do. It may not matter much when customers have no choice but to do business with you (sellers’ market). But, if they have choices (buyers’ market), they will go elsewhere. Don’t annoy students with bad teaching. Now and in the future, students can go elsewhere. So make students happy with good quality teaching. You will notice from the above-mentioned surveys that students are not asking for professors to be easy. They want to be challenged and will accept some discomfort. But, they also want teachers to abandon traditions that make learning complex, boring, unpleasant, and less effective. We have to deliver on what students want. This suggests that the process for obtaining student feedback must be improved as well as the criteria for evaluating both the course and the professor. The surveys provide a starting point evaluation criteria. There is sufficient empirical evidence for college and university administrators to take immediate action. Unfortunately, the work will be assigned to committees that will labor for 12 months to figure out a new process and sensible evaluation criteria. I recommend instead that kaizen be used for this an other challenges, replacing most committees and committee work. Over three, five, or seven days, a team of 15 faculty, staff, students, alumni, and other stakeholders can come up with an improved process for course and instructor evaluation and some visual controls that teacher can begin to use immediately to help improve teaching. They should also be able to create the an outline for an internal course on improving professor’s teaching skills. Another kaizen team can develop the teacher training plan into a helpful short course. One top administrator in my university system said: “It’s all about the students. Students first, always.” Prove it.